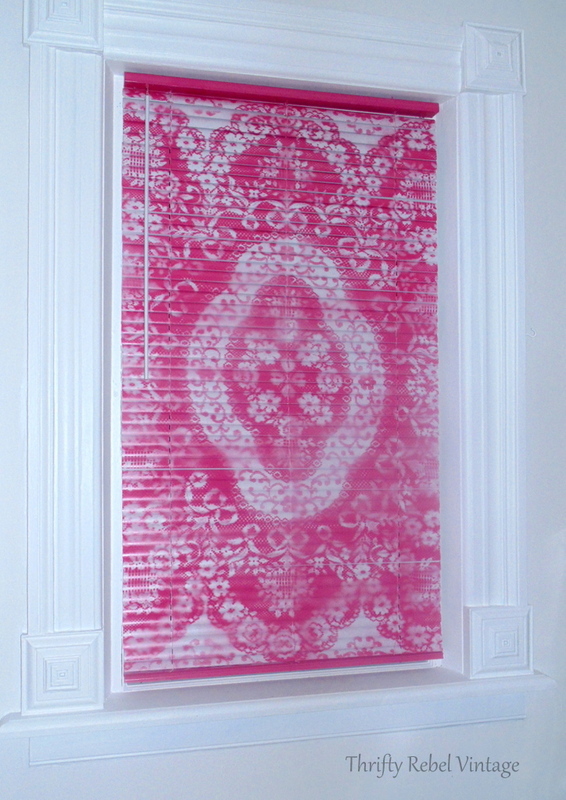 I’m super excited to be sharing today’s project with you… my mini blind makeover with spray paint and lace. When it comes to transforming anything lickety split spray paint is always my go to. But for my window blinds I really needed to take them even further than where spray paint alone could take them. I really wanted to punch up the fearless fun and funky factor. Having a spray paint can in my hand always makes me feel decoratively powerful. Like my home is my decorative oyster, and anything is decoratively possible. 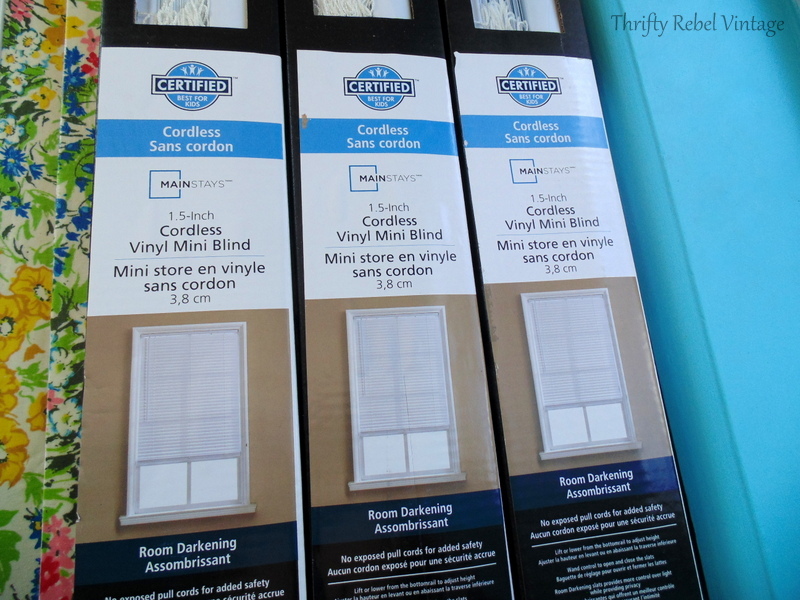 Here are the mini blinds that I found at a big box store. I was looking for something cheap and practical and I loved that they were cordless. No worries about the cats playing with or getting tangled in them. They do their privacy job very nicely but for me they’re kind of… well actually… a whole lotta boring. Sorry, but I just had to say it. If you love the blinds white that’s awesome, but I’m a color-loving girl through and through and I need it to keep me sane… especially during our long, cold, and snowy winters. 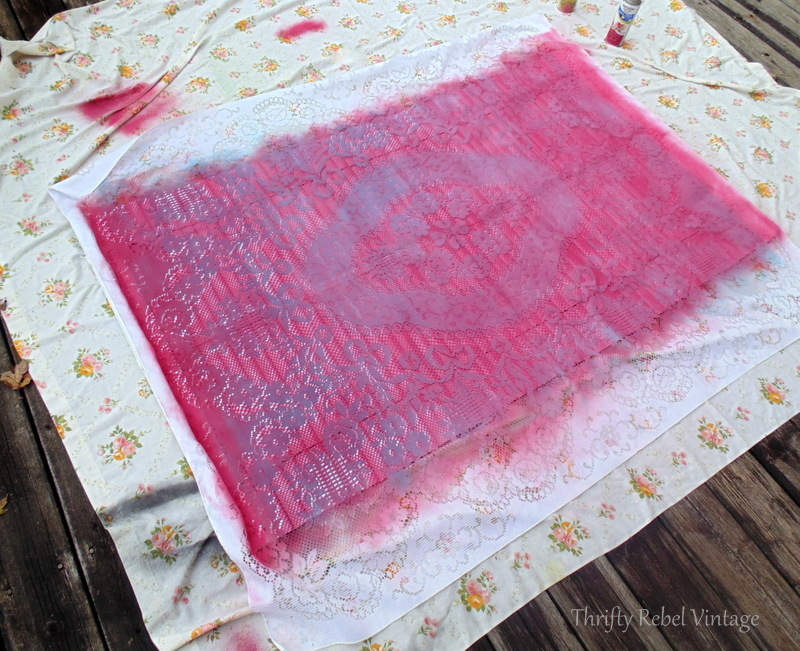 Years ago, way before this blog was even a glint in my decorating eye, I spray painted a table using a thrifted lace curtain as a stencil. 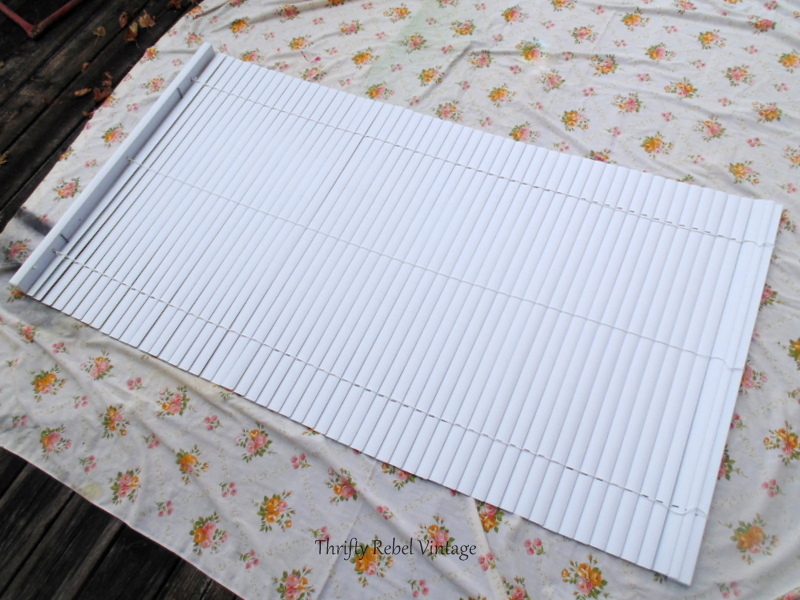 So I thought… why not try that with my mini blinds? I hammered a few nails between the top rail and the blind slats so I could pull the blind all the way out while it was lying down. Then came the most tedious part of this project, making sure the slats were where I wanted them to be… somewhat evenly laid out. They will move on you if you turn your back on them. Once all the slats were behaving themselves I laid my $1 thrifted lace tablecloth across the mini blind. 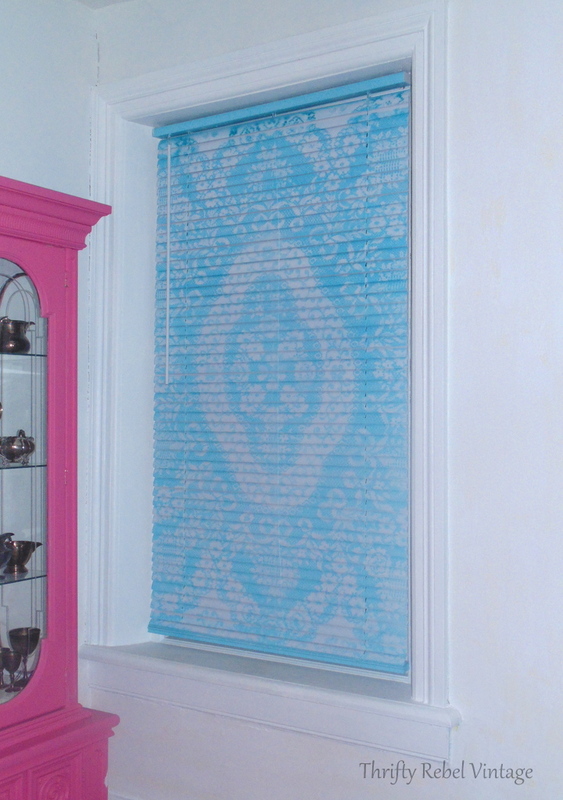 I had already done one of my mini blinds in this pretty aqua blue, but it was a sunnier day and the pictures were terrible. 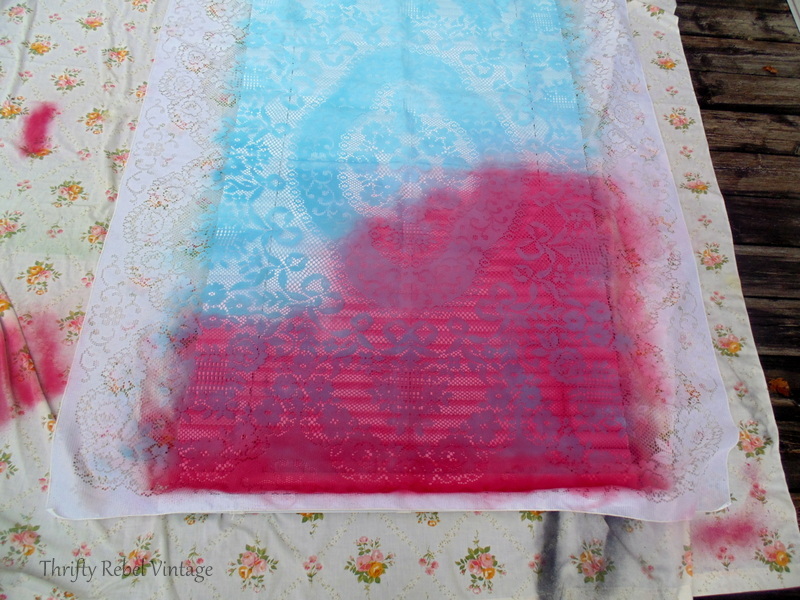 But, I was able to get all three blinds done with this one tablecloth before it got too stiff from the paint. 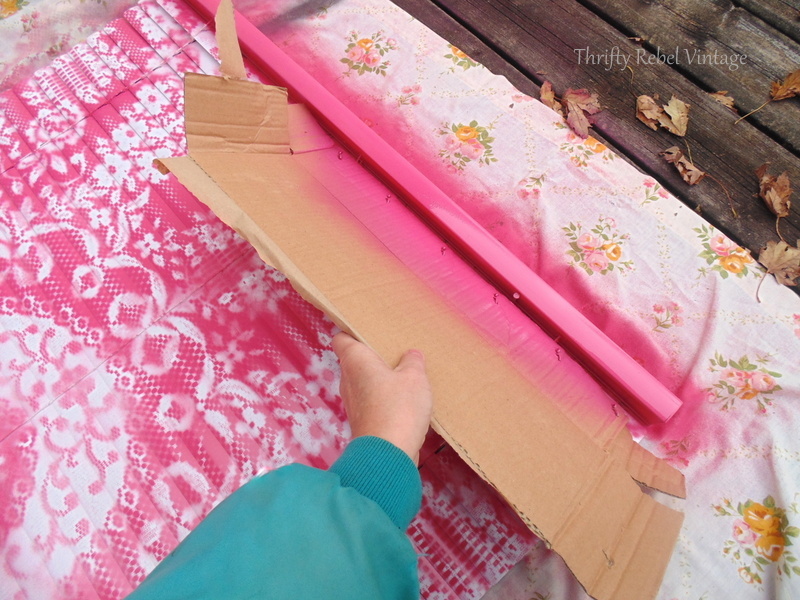 Let the lace, or whatever you use, dry before using it on another blind so you don’t get wet paint on it. This one is getting a berry pink treatment. The most important thing about spray painting through lace is to always hold the can directly above where you’re painting. Don’t spray paint from the side. If you do you risk paint getting beneath the pattern that you’re trying to stencil. 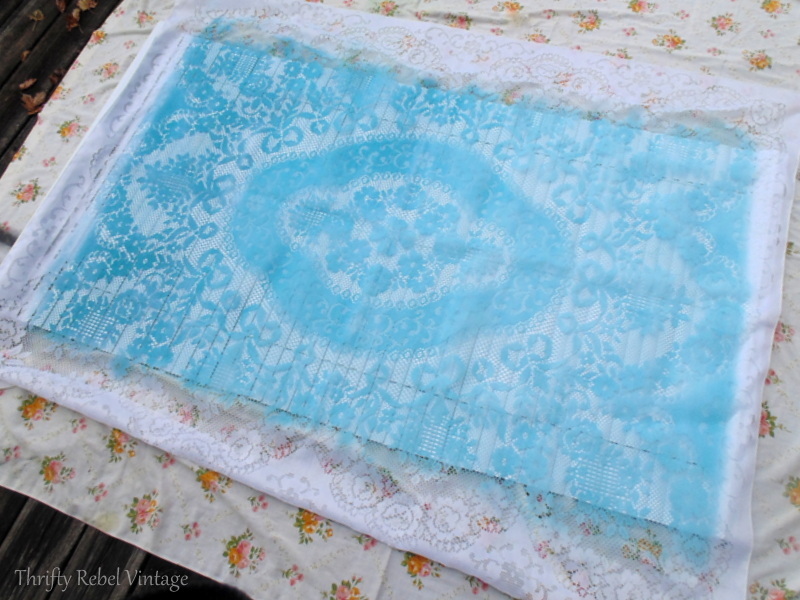 For most spray painting projects I do two or three light coats, but because I’m using the lace as a stencil here one light coat is all that’s needed. If you’re feeling unsure about your technique you can do a test with a spare piece of lace over a small piece of wood or even an old sheet. Whatever you have, just so you can get the hang of the spray painting. Here’s my mini blind all spray painted. I quickly removed the lace tablecloth because you don’t want it to dry on your blind, which I left to dry for about 30 minutes. One thing to keep in mind is that no matter how careful you are when spray painting your mini blind your pattern is not going to be perfect. And, quite honestly, it’s not supposed to be. This is a project where you have to be fearless and just go for it… and you don’t stress out about it even one little bit. After my blind was dry I used a piece of cardboard to protect it so I could spray paint the top rail. And I did the same for the bottom rail. Here’s one living room window before. And here it is all pink and delicious. My pattern kind of reminds me of tie-dye without the different colors. 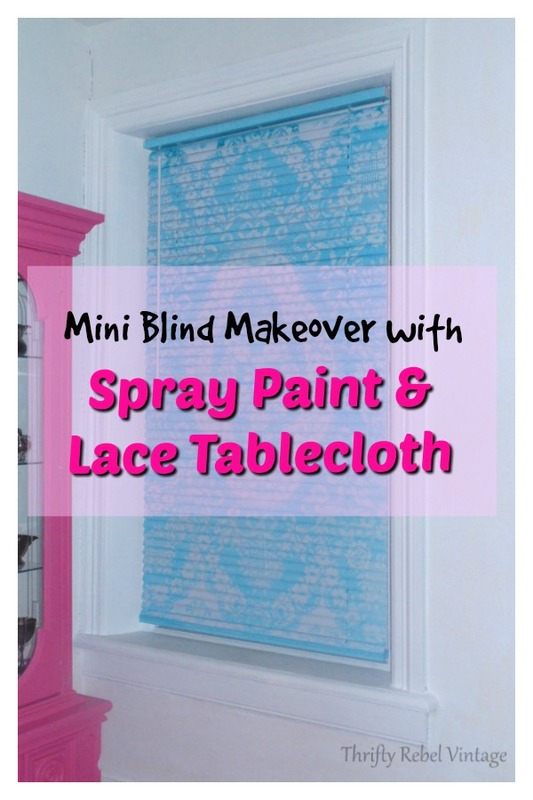 This mini blind makeover with spray paint is an easy way to give blinds some real personality using whatever color you love with any lace curtain or tablecloth pattern. Just please don’t use something that has sentimental or monetary value. This is a project meant for a cheap thrift store piece. So here’s the before of the front living room window above my decoupaged floral tablecloth desk. And here it is now with its happy green makeover. I don’t have a before picture of this window beside my pink china cabinet, but here’s the aqua blue after. Now before you go ahead and think that I’ve totally lost my decorating marbles I can assure you that there are reasons for the method of the different color madness. The first reason for the 3 colors is that I’ve come to know myself well, and I get bored over time and need change. I can easily move these blinds around for a whole new look in the living room. The second reason is that I’m going to attempt to make my own curtains. Say what? Oh yes, this non-sewer is going to make repurposed curtains. Out of what? Sorry I can’t say because it’s a secret. When they’re done all the colors of my living room, aqua, pink, and green will all tie in together. At least that’s what the vision in my head is promising me… and I have to trust that vision. Fingers crossed! And the third reason is just because I wanted to. lol. Your home should be your decorative oyster, where anything you want to do is absolutely possible. Pin to your favorite board and share with your friends. So cute, Tuula! Great idea! Amazing! And I like the idea that you can change them around. Now to wait for the curtain project. 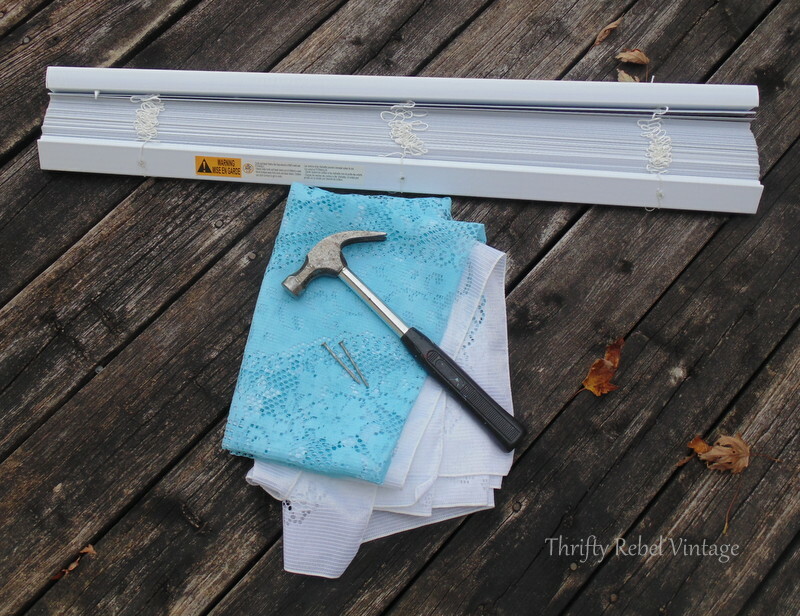 I wonder if you could use a bunch of ratty doilies, changing the position of each on each blind? 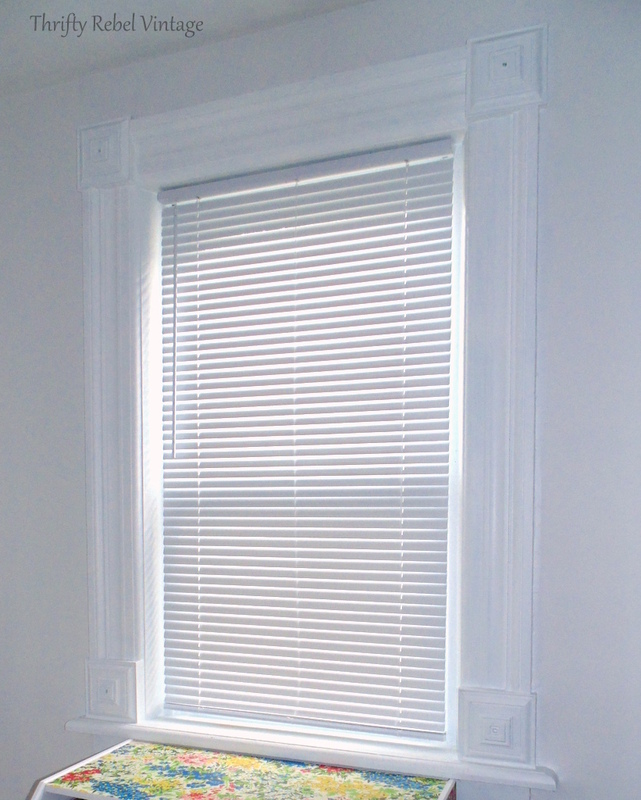 So many possibilities…..so few blinds, lol. Maybe some kind of stenciled motto or randomness. Yours turned out gorgeous. The colors are so pretty. Thanks for brightening my day. Thanks Mary! I think doilies would look fabulous, and stenciled words would be amazing too. You’re right, there are so many possibilities! Won’t the paint stick when trying to opening the blinds? Hi Cindy, the paint would only stick if you’re very heavy handed when spraying. It was not a problem for me at all. The trick is to do a light even coat. Thanks Dona! I have no idea how it works from a technical standpoint, but all I have to do is put my hand beneath the bottom rail and push it up. It’s like magic! They turned out so pretty! I could see this being done with grays or tans if a person doesn’t like color too! This is an awesome project & you did a great job. Really like the idea. I never would have thought of this but what a WOW moment for brainstorming! I could see using stencils too. I’ve just invested in several for other projects and here’s another way to use them. I like the idea of using doilies too. Great inspiration. Thanks. What a great idea! They came out beautiful. They sort of look like fabric shades now. So pretty. Looking forward to seeing the curtains you make also. Someone mentioned using doilies. I bet you could get a real boho chic look using different doily rounds and colors. You should post this on Hometalk. Thanks Debra! 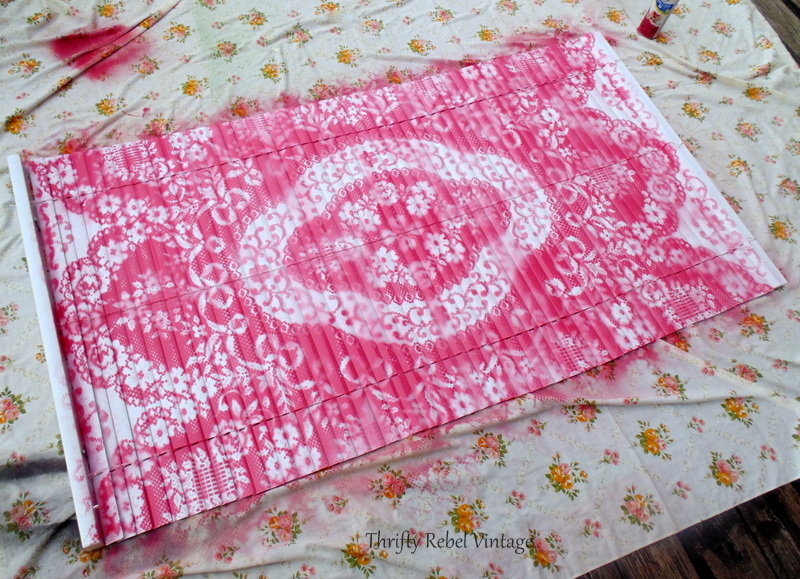 A collection of doilies used as stencils would look amazing, and would be so fun to try. 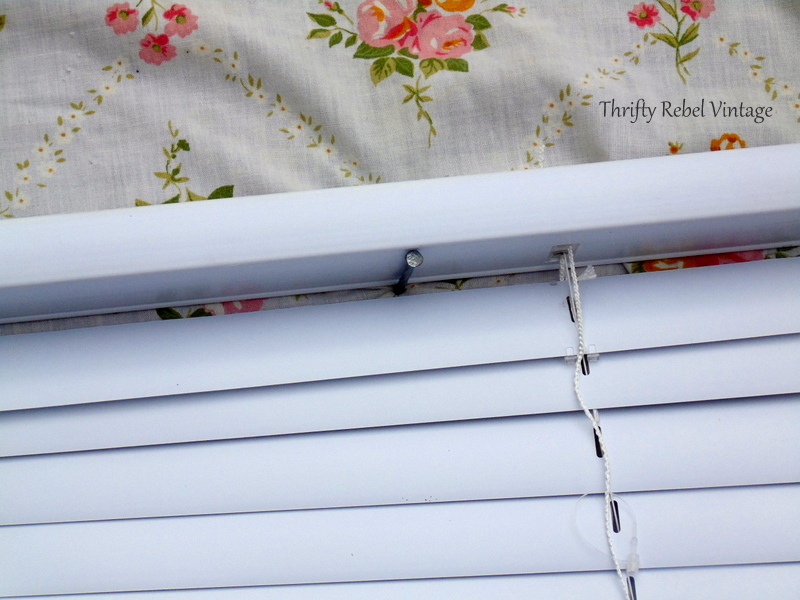 Great idea to update those eyesore blinds on the cheap! Thanks very much Mary! You’re so right. Sometimes the price is right, but items need a little help to turn them into something more. I love your new blinds, anxious to see your curtains. 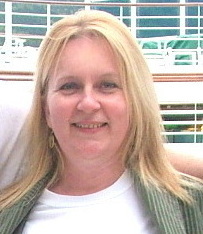 I can sew and do some every now and then, but your idea is appealing to me. I really enjoy your ideas and have used a few. Thanks Koleta! I’m so happy that you’ve used some of my ideas. That makes my day! You’re Amazing! I don’t know how you keep coming up with all these wonderful ideas. 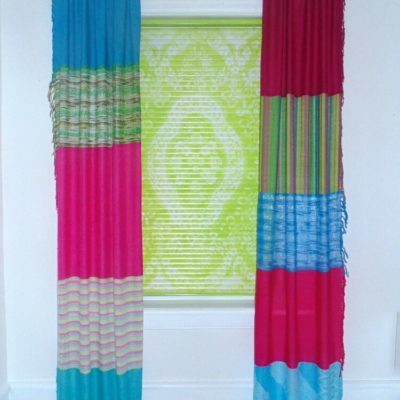 Love this idea I think I will try it and take down my curtains. Thanks for the idea. I love this idea ! but have a question…when removing the lace panel the paint is still wet right? will it smear? and if you put the wet panel on a new blind will that smear? or do you wait for it to dry in between the blind “painting? I am new to this sight and I just have to say all of the projects I have seen have been amazing you guys are so awesome thanks for the inspiration you guys make me feel like I can do anything ? These are absolutely beautiful! I’m a metal finish kind of girl, and can’t wait to go buy some blinds! My question is, how do you spray paint above the blinds and not tilt the can? Wouldn’t you have to hang them? Thanks Marjory! 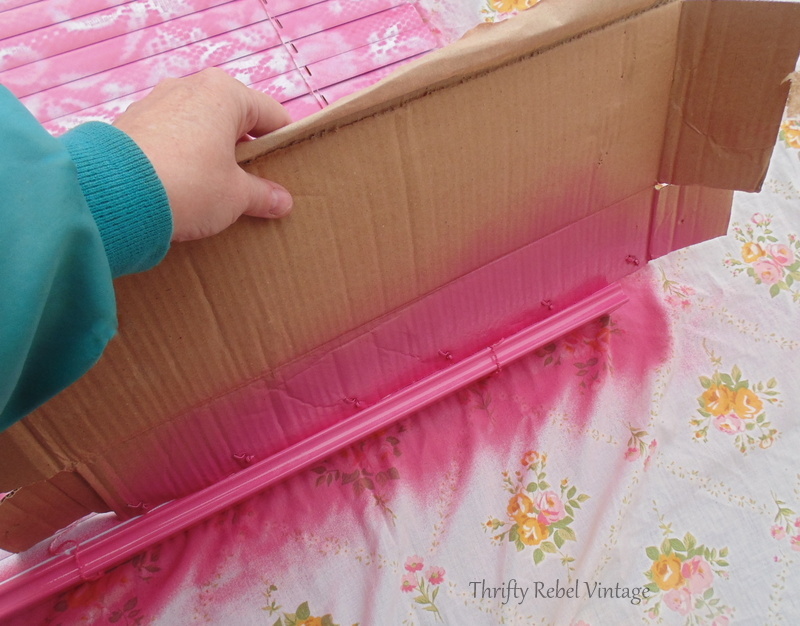 The can can be slightly tilted when you’re holding it, but you still want to be spray painting from above the lace and not from the side. You could certainly hang the blind if you wanted to, but it’s really not necessary. A metal spray paint would look amazing! 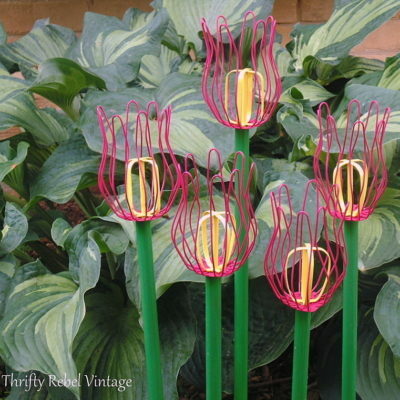 These look great and so unique! I LOVE the aqua one. Can’t wait to see your curtains! Thanks AnnMarie! Why am I not surprised by that? lol. 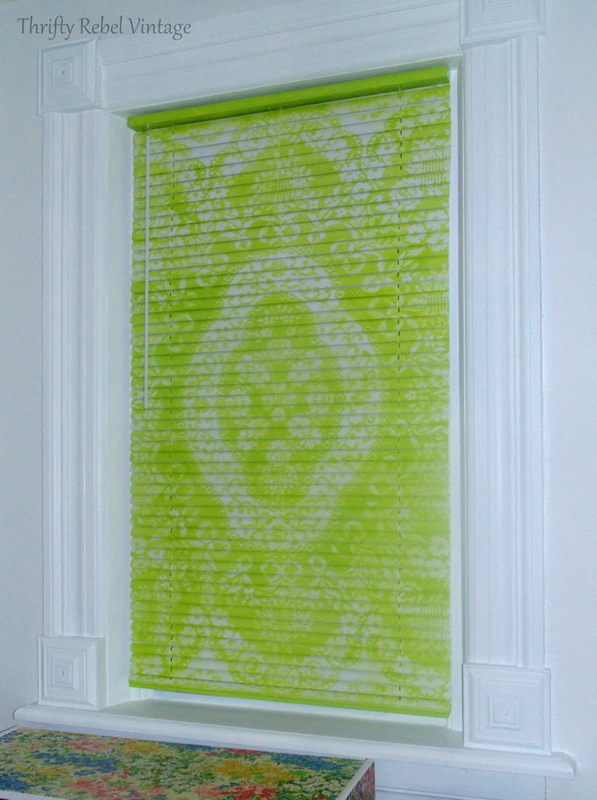 Tuula this is such a spectacular way to transform those boring blinds. Thanks for sharing this idea! Would this work on larger slate blinds..just found u r site…? ? ? I’m not sure Ronnie, but if it were me I would give it a try. I think it works better on wider slats than narrower, which is why I bought 1 1/2″ rather than 1″ slats. Wonder if this would work on a small bathroom wall? Technically I think it would work but the issue for me would be spray painting inside, which I never do and wouldn’t recommend because of the fumes. 1) where do you find a “cheap” piece of lace this big? 2) when the blinds get turned partially open, isn’t there a part of each slat that didn’t get painted because they slightly overlap each other? 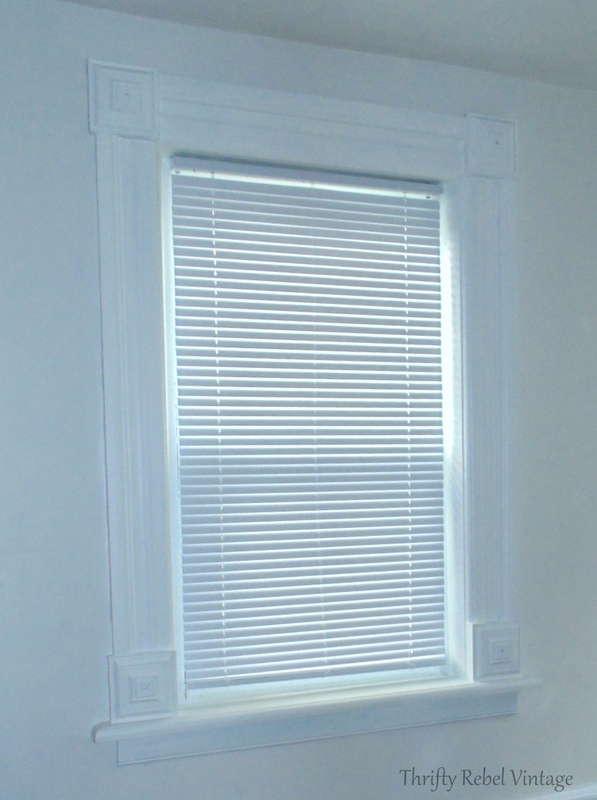 3) what is the material of these blinds? Metal? Plastic? I guess knowing would determine the correct spray paint. You definitely are one of the more inspiring people I’ve seen since subscribing. Hello Tuula ,beautiful work, I am so excited to try this, how many cans of paint did it take per blind? I love this idea I’m going try it right now, I’ll send pics when I am finished but I’m thinking i may leave some of the fabric and cut with a razor on every other piece of blind.